Identification: Adult B. marinus have a short, squat body with short legs. They are shades of brown, varying from yellow, red, to olive-green, sometimes with spots of white across the back, sides and legs. Their undersides are yellow with black flecks. Their skin is dry, often with rows of warts on areas. B. marinus are the largest toads, varying from 4-9 inches in length. The females are markedly larger than the males, while the males have more prominent rows of warts. When a toad is attacked, its defense is exuding a milky fluid, ("bufotoxin"), from these warts, which act as an irritant to the mucous membranes of the attacker. There are 2 concentrations of the poisonous glands behind each eye. They are known as parotid glands. These glands are very prominent and are a key distinguishing feature of the species. The poison does not protect the toad against all predators, for most snakes and birds seem to be unaffected and humans tend to only get skin irritation, but it is fatal to small animals as well as many domestic cats and dogs. It has also been reported, though not confirmed, that humans have died from eating B. marinus and/or its eggs. Tadpoles are jet black above and silvery white with black spots below. Original Distribution: B. marinus naturally occurs from the Amazon basin in South America, through Central America to extreme southern Texas along the Rio Grande River. Current Distribution: Including its original distribution, B. marinus have been introduced by humans across the Caribbean, and specifically in Puerto Rico, Haiti, Hawaii, and Florida, as well as the Philipines and Australia. 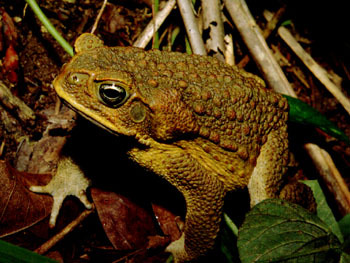 Site and Date of Introduction: In Australia, where B. marinus has posed the most threat, the toads were introduced in the sugar cane plantations of North Queensland in July 1935. In Florida, where B. marinus are becoming more and more of a problem, they were introduced into the Miami International Airport in 1955. Mode(s) of Introduction: In Australia, the toads were deliberately introduced from Hawaii to control scarab beetles that were pests of sugar cane. The Australian Bureau of Sugar Experimental Stations imported approximately 100 toads from Hawaii, bred them, and released more than 3000 in 1935. In the U.S., B. marinus was introduced as a biological control agent for agricultural insect pests, as well as to help control rats and mice. Introductions were attempted in Florida, but were not successful. In 1955, an importer accidentally released the species in the Miami Airport, and this time, ironically, the toad established itself in Florida. Reason(s) Why it has Become Established: The B. marinus' main limiting factor to its fitness is temperature and humidity. In any tropical or near tropical zone, these species flourish because they will basically eat anything, and do extremely well in disturbed areas. They are notorious for eating dog and cat food! Though they have many predators who prey on both adults and tadpoles, females produce so many eggs that this factor is offset. In addition, adults have the strong defense of the bufotoxin, to which most mammals in non-native areas have not adapted a counter defense. Their extremely prolific reproduction, effective adult defense, and ability to thrive in areas where native species are stressed, make the B. marinus a ferocious competitor. Ecological Role: B. marinus is a tropical species that prefers forested areas with semi permanent water nearby. Adults are nocturnal and during the day and in cold or dry weather they shelter in moist crevices and hollows. They can survive the loss of up to 50% of their body water, and can survive temperatures ranging from 5 - 40ºC. B. marinus eat almost anything they can swallow, including pet food, carrion and household scraps, but most of their food is living insects. Beetles, honey bees, ants, winged termites, crickets and bugs are eaten in abundance. Marine snails, smaller toads and native frogs, small snakes, and small mammals are occasionally eaten by the toads. The tadpoles of B. marinus eat algae and other aquatic plants which they rasp off with five rows of tiny peg-like teeth. They also filter organic matter from the water. Large tadpoles sometimes eat B. marinus eggs. In ideal conditions, a tadpole becomes a toad in 34-50 days which can then reach adult size in less than one year. Only a minute fraction of the baby toads survive to grow up because of their many predators. Dragonfly larvae and other preying water insects kill the toad larvae. When the toads are mature, dogs, snakes, larger frogs and toads, and birds, all prey on them. In their non-native areas, B. marinus are found mainly in disturbed areas, such as around buildings and in yards, and near canals and ponds. Benefit(s): Because of their voracious appetite, B. marinus can reduce the number of insects in a place infestation is a problem. Threat(s): Though everything adds up to the conclusion that B. marinus could outcompete native fauna, this has yet to be established. It is suspected that there is a reasonable correlation between the reduction of some frog/skink populations and the invasion of B. marinus in Australia, and the CSIRO (Commonwealth Scientific and Industrial Research Organization) have labeled them a "pest." · may carry diseases that are can be transmitted to native frogs and fishes. It is reasonable to worry about these same behaviors in Florida and other places the B. marinus has been introduced. They probably already compete with native frogs and toads for trophic resources and breeding areas. More than likely they also impact native amphibians through direct predation, since they will feed on most any organism available. To add insult to injury, the Australian introduction of the toads for purpose of controlling the beetles had little or no effect. This is because the greyback beetles are rarely on the ground where B. marinus live while their wide-ranging diet means it is not solely dependent on beetles for food. Though they are mostly a nuisance now, it is unclear how boundless their population growth will be and whether their non-native predators will hold them in check. Control Level Diagnosis: I recommend that a "minimal" to "medium" priority be given to controlling the population of B. marinus, erring on the conservative side of "medium." Though the species is considered an ecological threat, it has not been given top priority by the areas most susceptible at the moment: Australia. That is not to say that are NOT considered a problem, but it has not yet been demonstrated to be quickly causing the decline of the biodiversity of the invaded habitat. Since they do so well in disturbed areas, it is unclear whether the B. marinus is beating native species on their own turf or is taking advantage of native species' inability to effectively compete in the newer "disturbed" habitat. In addition, the toads' population is controlled by predation in their native area by predators relatively similar to ones that exist in the invaded areas. It is possible that the toad population will be eventually curtailed by such predation. More research needs to be done about the true cause of any biodiversity decline and the impact B. marinus has had on any such decline. In addition, a close watch should be kept on Australia and used as a guide for dealing with the toad population in North America and the Caribbean. Extreme caution is advised in the usage of biological and gene control agents. Control Method: Scientists at the CSIRO Animal Health Laboratory in Victoria, Australia have been searching for biological controls of B. marinus and in 2001 they began investigating gene technology as a mechanism of control. There is hope that a pheromone will be found in B. marinus and that it could be used to disrupt their breeding cycle. The main controls on the spread of B. marinus in southern Australia are quarantine checks and public awareness and response. Toads can be excluded from garden ponds and dams by a 50 cm high barrier such as an thick hedge or a wire mesh fence. The U.S. is using those same methods: public education and coordination.